We can still count the number of Blu-Ray silent film releases on the fingers of one hand, so the arrival of number five is an event. It’s F.W. 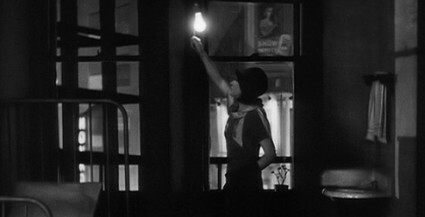 Murnau’s City Girl (1930), now released by Eureka Video. City Girl was Murnau’s last silent, released after Sunrise and the now lost 4 Devils. It is set in the wheatfields of Minnesota, and covers the trials of newly-wedded life for a farmer’s son (Charles Farrell) and a Chicago waitress (Mary Duncan) among the mistrustful farming community. The Blu-Ray only release is the 1080p high-definition 20th Century Fox restoration of the silent version of the film, with a new score, composed and arranged in 2008 by Christopher Caliendo. There is a full-length audio commentary by David Kalat and a 28-page illustrated booklet with an essay by Adrian Danks. And what are the other fingers on the hand? As reported on in an earlier post, we already have The General (from Kino Lorber), Sunrise (from Eureka), a selection of early Oz films as extras to The Wizard of Oz (1939) (from Warner Home video), and the unlikely The Story of Petroleum (1923) which is an extra on the Blu-Ray release of There Will be Blood. Releases are promised for this year which will take us up to two hands’ worth: Battleship Potemkin (from a Swedish supplier), and Our Hospitality, Sherlock Jr. and the complete Metropolis (all from Kino Lorber). City Girl is one of the rare positive stories of ‘missing’ films turning up. It first appeared in 1968 at the New York Film Festival after being discovered earlier in the year by a historian looking at the Fox vaults. The film had been lost until then, which is one reason this excellent and extraordinary film is largely absent from the historical literature. By memory from a first-class article on the reappearing film by Richard Kozarski in Film Comment, the film appeared just at the crucial turning point of early sound filmmaking in the studios. Fox decided to remake the picture into a part-dialogue sound film, and assigned a hack director to insert new dialogue scenes (memory: W. S. Woody ‘One Shot’ van Dyke?) When this was finished, it was released only in the Chicago territory, which included the city of Chicago and towns to the Northwest across Illinois and Wisconsin. It was a complete failure in the theatres. Never seen again, it became a legendary lost film of F. W. Murnau’s American period. And then, surprise!, it turned up in the Fox vaults on an early AFI search for archival materials. And, surprise!, the print was the original Murnau all-silent cut. The lost film is today the sound version that failed in Chicago. City Girl is a companion piece to Murnau’s famous initial Oscar-winning film Sunrise; this time the country boy goes to the city. In my view City Girl is much the superior film of the matched pair. I think this your first comment on the Bioscope, so a warm welcome. And thank you for the information on City Girl‘s provenance. It make you wish that such information were more readily available in filmographies. The Silent Era does something in the way of describing the nature and location of extant prints, but something that explains a little more why what survives does survive would be a grand project for someone to undertake. I’ve not seen City Girl as yet, but the disc is on order. I’m certainly keen to see how it matches up to Sunrise, given your second comment. I’ve now seen City Girl. A beautiful film, immaculately composed. A good deal more convincing as human drama than Sunrise, but I think a minor work because the vision is smaller. They do work well as companion pieces.